After a short break spent trying to come up with ideas for the other three Cluedo weapons, or the 'less funny trinity' as we came to refer to them, we are back. For years people have played Cluedo when there is literally nothing else to do, and we have been looking at just how effective the six standard weapons would be in a real life situation. We have already examined the Rope (not very good), the Candlestick (for the gentleman murderer) and the Revolver (loud). From prehistory to today, the dagger has been used as a means to kill. You don't get that kind of run at the top without being a pretty special piece of kit. Traditionally a short blade that is sharpened on each side and tapered to a point, the dagger is the ultimate silent and deadly weapon. Add a cloak to the mix and you've got an entire sub-genre of nefarious behaviour to play with. The unpleasant truth is that yes - a dagger makes a very good murder weapon. It always has and always will. It makes no sound, is easily concealed, has no moving parts and can be operated by all the various kinds of idiot. But in this day and age, is it a practical weapon for the lady or gentleman murderer of the Cluedo universe? The kind of upstanding citizen that would get invited to the kind of dinner party that Dr Black was throwing on the fateful night he was killed? Firstly, our would-be-murderer would have to conform to the current law regarding concealed weapons - it simply would not do for them to be caught by the local bobby or vicar with a machete strapped to their back - what would people think? This means the only 'dagger' that could be carried into a dinner party would be a swiss-army style folding knife with a blade no more than three inches in length. There is a sense of pre-meditation about the murder in Cluedo. It took planning and foresight to arrange for the six dinner party guests to be in different areas of the house at the time of the murder, perhaps some kind of spontaneous suggestion that they each go rooting around in Dr Black's things while he's finishing off the scallops (a trick that has been used ever since by producers of TV's Come Dine With Me in the hope that a murder may spice up ratings). It is hard for this reporter to imagine a successful murder could be carried out in this manner using a swiss-army knife. What if, in the heat of the moment, the murderer accidentally selected the fish knife? Or worse, the toothpick or bottle opener? This pre-meditated murder could collapse into anarchy, with the would be murderer having to resort to holding down his intended victim and waiting for the sun to come out so he can apply a fatal magnifying glass burn. Pros: Silent, easy to conceal, can also remove stones from horses' hooves. 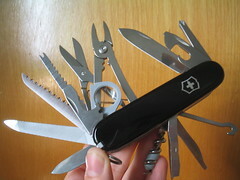 Cons: Fiddly, small, many functions could confuse in heat of moment. Regardless of which Cluedo weapon is best, the safest thing to do would be talk to us about running your next murder mystery event for you. 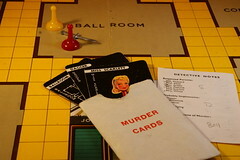 In Cluedo, the rope is represented by a small piece of yellow string, backed up with an ominous photograph of a noose on the corresponding card. At first glance, a rope doesn't seem to be a good choice for a murder weapon, particularly when you are in a house so filled with other potential tools of terror, like guns and knives. But don't let that fool you - in our exhaustive research we found that in the world of Cluedo the rope is used as a murder weapon exactly one sixth of the time. The hangman's noose has been scientifically proven to be the most unsettling knot to tie in a piece of rope. Turn up at a loved one's house with a length of rope and tie a few reef knots or sheep shanks, at best you might pique their curiosity. But turn up and sit quietly in the corner tying a noose, perhaps while humming a lullaby and crying - well, you have yourself a situation. 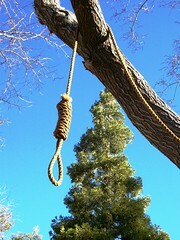 But despite the macabre nature of the noose, is it believable as a murder weapon? Not as a form of suicide, or execution, but one-on-one kill-or-be-killed murder? Just how would one go about committing murder armed with a rope? Option 1 - Wrap it around their neck and then squeeze until they stopped breathing. This is something the intended victim would be most disinclined to do. If you felt that you didn't have the strength or bucking bronco skills to hang on for the requisite amount of time then you have a couple of other options. Option 2 - Build a gallows. This is quite labour intensive and difficult to conceal, but with enough lengths of two by four, a hammer and some nails, a hinge for the trapdoor and a basic grasp of carpentry this is possible. Then of course you would have to persuade your intended victim to put his or her head through the noose long enough for you to trigger the trapdoor. You may also halt construction in the early stages as soon as you realise that the hammer, the nails or even the bits of wood would all make much more effective murder weapons. Option 3 - use a convenient beam or tree branch to hoist the victim into the air, using their own body weight to kill them. This option relies upon you both having the strength to lift your victim off the ground while simultaneously being heavier. Admittedly you could set up a pulley system to make the lifting easier, and hook your feet under a heavy piece of furniture, but you still have to get the noose around the victim's neck - good luck with that. So is the rope a practical murder weapon? Well no, it's rubbish isn't it. There are many household objects that have basically the same killing power as a rope, the same kind of 'wrap around neck and squeeze really tight' functionality; bedsheets, trousers, snake themed draught excluders, your own arm, small but flexible children/animals, curtains, Peter Storm cagoules, his or hers towels - the list is practically endless. Another list practically endless is the list of household items that would make far more effective murder weapons than a rope; knives, bottles, ornaments (including candlesticks), tools, most small items of furniture, windows (either shattered fragments thereof or means of exit from upper story), frying pans, irons, toasters, bathtubs, doors and bleach. Pros: Has historical creepiness to it; with element of surprise and luck can be effective. Cons: Requires more elaborate scheming than most murderers have time for; rope also haven for DNA, should you actually be successful - which you won't. It is perhaps strange that the revolver is only used as a murder weapon in Cluedo one sixth of the time; at face value, it has the benefit of range, ease of use and simplicity. Point and shoot. So why is it that five sixths of the time would-be-murderers would rather use blunt, sharp or hessian objects rather than the combination of gunpowder and lead? The kind of mathematical certainty one gets when randomly selecting one of six cards? Or something more? Guns are loud. Really, really loud. They weigh in at around 140 decibels, which is loud enough that in a confined space can easily cause permanent damage to your ears. One way to catch someone who had just fired a gun inside a stately home would be to go up to everyone in turn and say, in a loud and clear voice, “Guilty people say ‘what?’” - case closed. Silencers don’t silence, they merely reduce the sound from the volume of a gunshot to the volume of, say, a jet engine. Again, that’s something other party guests are going to notice. Another way of solving the Cluedo crime quickly would be using Gun Shot Residue, which basically means every time you fire a gun your hand and arm get covered with little particles from the gunshot, that can be linked back to the exact gun you fired. The revolver is an interesting choice of weapon for a would-be-Cluedo murderer, because the actual killing part is the easy bit - it’s returning yourself to a position of ‘reasonable doubt’ among the cast of suspects that is hard to do. Mind you, I suppose that’s what secret passages were invented for. Pros: Simple to use; effective; ranged. Cons: Noise; forensic evidence; bad for ears. Since 1949 Cluedo has allowed us to investigate the death of Dr Black at the hands of one of six colourfully named characters, who did the deed in one of nine rooms and with one of six weapons. It's a process of elimination exercise, and has been filling the time in between dinner and television admirably for millions of families for years. But just how practical were those murder weapons? The revolver, the spanner, the candlestick, the rope, the dagger or the lead piping? It lacks the penetration of the dagger or the stopping power of the pistol, but the candlestick would appear to be favoured by murderers in the Cluedo world exactly one sixth of the time. This heavy and relatively club shaped ornament would traditionally be made from brass, giving it a lot of weight and a reasonable amount of bludgeoning power. Readily available in most homes that have nine or more rooms in the ground floor, often in the Dining Room or Library, the candlestick makes up for in availability what it lacks in portability. The primary weakness is the size, weight and shininess of the weapon. In the criminal fraternity studies have shown that guns, knives and explosives are preferred to items of decorative brassware when dispensing 'street justice' - and with good reason. A staff member of the restaurant in The Godfather would no doubt have noticed if a massive brass candlestick had been hidden behind the cistern, and rumours that the first draft for Die Hard had Bruce Willis confronting the terrorists at the end with a candlestick attached to his back with Merry Xmas tape have been debunked by industry insiders. In a lot of ways, the candlestick is the lightsaber of its day; an elegant weapon, for a more civilised age. It harks back to days of pomp and chivalry, tradition and class. If a Jedi would charge down blaster fire and cavalrymen would wave swords at musket balls, then surely it's perfectly acceptable for a gentleman to bring a candlestick to a gunfight? Cons: Fingerprint vacuum; heavy and shiny; hard to conceal in a prison shower or dark alleyway; is a massive candlestick. Next time: the revolver... is the convenience worth the noise?